I’ve limited enough knowledge of boxing and I don’t have Sky Sports anymore so I’ve no access to most fights but I do enjoy the sport so starting this thread again - it might even entice Corleone back to the board. Katie Taylor has just been crowned world lightweight champion in India. I was hearing her results as the competition progressed and she won her first few fights against ex-champions on the 15 point rule - basically if you open up a gap of 15 points (before the last round) the contest is deemed over. She won one of her fights by stopping her opponent in the first round. Now she’s after winning the title against the reigning champion 31-14. It’s the margin of her victories that’s so impressive - nobody has come even close to her. Fair play. She’s only 20 and ranked number 1 in the world. She is now expected to win the boxer of the tournament award. This Katie Taylor is some fighter. None of her fights go the distance. She won yesterday by stopping some other lass in the second round and today she won her European quarter-final with a 30 second knockout. Defending European lightweight champion Katie Taylor advanced to the semi-finals this year’s event following a stunning first-round knock-out of Spain’s Mc de la Guia Guerra in Vejle, Denmark this afternoon. The St Fergal’s Bray woman, boxing out of the blue corner, dropped the tall Spaniard with a left hook after just 30 seconds and her opponent was counted out. Taylor, the reigning World 60Kg champion, is targeting her third European title in a row. The 21-year-old will now meet Yana Zavyalova from the Ukraine in tomorrow’s semi-final. Zavyalova, ranked eleventh in the World and eighth in Europe, recorded a convincing 20-6 victory over Germany’s Natalia Kalinowski. Taylor, who is ranked number one in the World and Europe, is guaranteed at least bronze following today’s win which saw her rack up an eight point lead before bringing the bout to a premature end with a stinging left. I wouldnt mind getting in the ring with Robbie Keane. It’s women’s sport so it doesn’t count. Obviously I wouldn’t say that to her face though. What’s the non-Irish hyped opinion of John Duddy? After much Kimball-generated interest I watched a couple of his fights a few months ago and thought he looked pretty ordinary. Slow hands, slow feet, very plodding, deliberate style and not the quickest-thinking looking either. I expect it’s only a matter of time before some proper boxer with a bit of class picks him off in the first few rounds before unloading in the fourth and fifth. Is it Brian Peters promoting him here too? He did a cracking job with Dunne. Not many fighters sell out the Point when they’re still way off world title level but he got RT on board from the start and played on the general lack of public knowledge in the sport. Nobody really knew if the lads he was fighting were any good but we realised soon enough last time around. Having said all that he has a decent pedigree on paper. He’s won nearly half his fights in the first round and he has beaten plenty of guys with decent records. He won’t be helped by the two switches to his opponent this weekend I wouldn’t think. There is talk of Duddy having a world title fight against Kelly Pavlik in the next 3 months. This would be a bad move imo. Dont think he is near ready for a world title fight. Maybe in 18 months or so but certainly not now. Duddy has a decent formline for Jermain Taylor too. He stopped Cuevas who had gone the distance with Taylor and only lost on points. I suppose that’s not as impressive as actually knocking Taylor out though is it? I don’t think Duddy is promoted by Peters. I think he’s some semi-Irish American publican behind him, called Irish Ropes Promotions or something. Saw interview with him ages ago in programme about Duddy and seemed a to be a flat-cap wearing cute hoor type. Duddy fight here. Stay tuned at the end for flat-cap promoter and then a quick glimpse of a young Bandage in the crowd. I think I know which one you reckon looks like me. Not much happened in the fight to be honest. The kid didn’t look like he wanted to be there and Duddy missed as much as he landed with. It wasn’t much of a fight. Duddy wasn’t particularly impressive but it was hard to be when that guy had no interest in fighting at all. Soon to be forum member Jesus said that Bandage looks like Shaun Murphy. I’ll take that as a compliment. 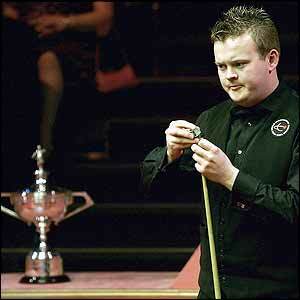 Shaun Murphy is a pretty little thing. Duddy was meant to have been quite unimpressive last night back in the US. Kelly Pavlik was ringside for the fight and it was supposed to be Duddy’s final warm-up bout before a title shot against him but he sustained considerable cuts around both eyes and it looks like he won’t be recovered in time to face Pavlik. I think it could be for the best as I’d like to see Duddy have another fight or two before getting in with Pavlik - I don’t think he’s ready for that level yet. It appears that Tyson versus Holyfield Part III is going to take place. I don’t have much time for heavywieght boxing, and the unification bout last weekend was meant to be a pile of poo, but I’d watch this one. Andy Lee got stopped last night in the 7th round - not good seeing it was his first time headlining on live TV in the US. He was ahead on all judges’ cards but got into a slug-fest in the 6th and 7th and the referee stopped it, possibly prematurely. Not a fatal blow to his prospects but a loss he could have done without. Meanwhile, Katie Taylor hammered the fook out of a load of unfortunates in a tournament in Russia yesterday and was awarded best overall boxer too taking all the different weights into account. Thing is she’s probably not even the hardest bird on her street in Bray. You have to sign up to the channel but there’s no annual contract - you just have to give 30 days’ notice of cancellation. So just order the Setanta pack and then cancel when you want to and it works out about the same as PPV. Should be a smashing fight. Was hoping Mayweather would beat Hatton but I’ve way more time for Calzaghe and hope he wins. Don’t think he will though.